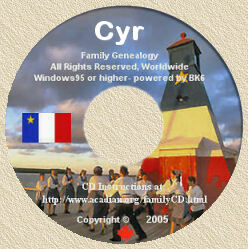 Acadian Genealogy Homepage; Acadian roots in Maritimes go deep! Acadian roots in Maritimes go deep! Acadia! It's a name that angered an Empire and stirred the blood of poets. A name still synonymous with British shame. Today, it embraces the French-speaking areas of Nova Scotia, New Brunswick and Prince Edward Island whose roots stretch back four centuries. But in the early 1600's, Acadia was confined to the Bay of Fundy's shores, a community unique in North America. Because, rather than fish or pursue the thriving fur trade, its French-born settlers chose to farm. Using the rich loam of Fundy's coastal marshlands to raise crops and cattle, they built ingenious stake-and-earthen dikes along the shore to block the world's highest tide and drain the land. Unlike most New World settlers, the Acadians made peace with the local Indians, converting most to Christianity. Their only foes were their chief trading partners, France and Britain. At war for 150 years, both nations alternately claimed Acadia as a strategic military base - while its people asked only to be neutral. In 1755 Britain demanded that they swear allegiance to the Crown. But loath to renounce their heritage, most refused. And so began Britain's dishonour and Acadia's anguish. As their villages were torched, a few families fled to Quebec. But out of the estimated 15,000 settlers, nearly 10,000 were deported. Most were herded onto ships to France, Britain, the Caribbean or New England, but at various ports they were refused entry. Two boats sank taking 700 lives, while hundreds died of scurvy at sea, or starved in refugee camps. Only Spain offered free land in what is now the southern state of Louisiana, were a wave of "Cajuns" settled. It wasn't until the fall of New France that Britain even acknowledged the heartless expulsion of its peaceful agronomists, tacitly allowing the exciles to return - not, however, to their lush Fundy farms, which had been given to American Loyalists, but to rocky coastal tracts. Still, since Acadia was their homeland, nearly 4,000 returned. In scores of communities, the Acadian tri-coloured flag flies proudly. New Brunswick alone is 35 per cent Acadian, and officially bilingual. Along its eastern edge stretch the "Acadian Coasts" - a blend of seaports, sand dunes, salt marshes and rocky crags. In picturesque Caraquet, the oldest French settlement, lies Acadia's core. Each August its popular 12-day Acadian Festival includes the blessing of the fishing fleet and the Tintamarre street celebration. The town's Acadian Museum is filled with historical artifacts. Just 10 km west, the huge 1,133-hectare Acadian Historical Village dramatically recreates a typical settlement. More than 40 rustic houses were moved to the site where costumed "residents" describe their daily lives from 1780 to 1890. The witty actors also work in the village's gristmill, smithy, printing shop, school and far houses, which sprawl through woods beside a river. The canny old Acadian scrubwoman, la Sagouine, became world-renowned through the novels of Antonine Maillet. Now in the town of Bouctouche, Maillet's birthplace, la Sagouine and her ribald neighbours perform at the hugely popular Pays de la Sagouine. Moncton (New Brunswick) is best known for its 7.5-metre tidal bore which pulses up the Petitcodiac River twice daily, as well as the massive Palais Crystal shopping/amusement mall and the famous Magnetic Hill on which cars seem to coast "uphill" - now adjoined by the garish Magic Mountain Water Park, attracting 120,000 visitors yearly. Yet the Acadian Art Gallery and Museum, with its 3,000 beautifully displayed artifacts is definitely worth a visit. On the hill atop Halifax, Nova Scotia's 252-year-old capital, stands the Old Town Clock (donated by Prince Edward Island in 1803), and behind it, the famous British Citadel, which fires a cannon each noon. In city graveyards lie the victims of two infamous disasters: the 1913 Titanic sinking and (four years later when two warships collided) the Halifax harbour explosion - history's largest before Hiroshima - which instantly killed 2,000, maimed 9,000 and leveled the city. Yet one of Nova Scotia's major draws is its thriving French heritage. By 1632, 45 Acadian villages rimmed the upper Bay of Fundy's shore. Today the home of 8,000 Acadian descendants, its coastal highway is called the Evangeline Trail to honour the heroine of Longfellow's classic poem about the forced Acadian exodus. In Meteghan, north of Yarmouth, the Musée La Vielle Maison is a former Acadian homestead, where guides explain the area's history. Nearby, Church Point boasts the continent's largest wooden church, Eglise de Sainte-Marie, with its 56-metre steeple ballasted by 40 tons of rock. And at the village's Université Saint-Anne the play Evangeline, a singing-dancing delight, is performed in vernacular Arcadian - an English synopsis is available. In Annapolis Royal sits star-shaped Fort Anne, Canada's first national historic site. While the nearby Historic Gardens show how the Acadian's unique dikes, reclaimed marshland. Ten kilometers west is Port Royal Habitation founded by Champlain in 1605, the earliest settlement north of Florida and site of the continent's first grist mill and social club. Though the British razed it, Port Royal has been rebuilt from Champlain's original plans, and the compound now encloses the governor's and priest's homes, bakery and army posts around a central courtyard. To the north, the Grand-Pré National Historic Site is all that is left of Acadia's largest settlement, emptied by the deportation. But Evangeline's bronze statue now commemorates the tragedy, and Saint-Charles Church houses an exhibit of the Acadian diaspora. Yet the most impressive monument to French-might in the Maritimes, is the massive Fortress of Louisbourg in Cape Breton (Nova Scotia). With a population of up to 5,000, it prospered for more than 30 years before New Englanders captured it. Though France held it again for a decade, when Britain re-seized it, the prime minister gave the order: "It must be demolished." And it was. But since 1961, at a cost of $25 million, massive fortifications and 50 buildings have been reconstructed. With 100 costumed soldiers, merchants, servants and fishermen on the site, it's like walking the streets of history. Prince Edward Island boasts its own Acadian area, the "Région Evangeline," dating back to the first French settlements. In Miscouche, site of the 1884 Acadian Convention, the Musée Acadien is renowned for its early papers and photos. Another recreation of a 19th century settlement is the nearby Acadian Pioneer Village. And so, throughout the Maritimes, Evangeline's people proudly live on. Article written by Paul King and Barbara Fulton (based in Toronto, Ontario), reprinted (with thanks) from the Saturday August 14, 2001 Edition of The Toronto Star.